Captains of industry will rub shoulders with start-ups and social entrepreneurs at the seventh annual Belfast Business Top 50 at Stormont at 6pm on Thursday 29 September. 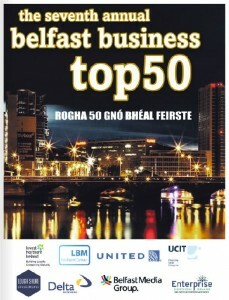 Hosted by the Belfast Media Group and backed by sponsors, including LBM, Invest NI and United, the event spotlights fifty champions of business who are creating jobs and wealth even in the teeth of a crippling recession. As well as recognizing business titans like Brian Ambrose of the George Best Belfast City Airport, Paddy O’Hagan of the New York Stock Exchange and Phillippe Dofroy of Dow, the listing also honours social entrepreneurs, and retailers as well as popular chefs Niall McKenna of James Street South and Bob McCoubrey of Mourne Seafood. Guest speaker at the celebration will be Sammy Wilson MP, MLA, Minister at the Department of Finance and Personnel. UCIT Social Entrepreur Award: Paul Roberts, Ashton Community Trust. Lough Shore Investments Best Start-Up Award: Wholeschool Software. Enterprise Agencies Impact Award: All Electical Recycling.